With the advent of the many beneficial uses of atomic radiation and nuclear technology over the last century, experts in both national and international fora have worked for the establishment and the evolution of a system of radiological protection (RP). Many RP principles have been agreed and accepted globally and serve as the basis upon which many national regulations and guidance are built. International bodies addressing RP issues within their charters, such as the Nuclear Energy Agency (NEA), through its Committee on Radiological Protection and Public Health (CRPPH), have contributed to the evolution of the system of radiological protection by sharing experience and knowledge. This practical feedback continues to refine the underlying principles of the international RP system. These principles also reflect state-of-the-art scientific knowledge, as well as the experience and collective understanding accumulated over many decades. Their application has long benefited from the very experts who helped to establish the global framework of guidance, standards, recommendations and best practices, and who are also involved in applying this framework in their home countries. A wide variety of guidance and standards documents are available. The technical facts are provided in these documents but how the different elements have evolved, and the full body of understanding that they reflect, are not well documented. Understanding the spirit of the RP system is an integral component of its effective application. In order to appropriately apply the RP system to existing and emerging situations, such aspects – the nuances, history and between-the-line meanings – need to be fully understood by tomorrow's leaders in order to progress in the radiological protection field. The CRPPH has long served as a forum for exchange and co-operation, to establish best practices, contribute to the development of the key recommendations of the International Commission on Radiological Protection (ICRP) and issue innumerable technical and policy documents that capture the state of the art of RP thinking at specific points in time. The NEA decided to develop a learning programme in order to pass on a deep understanding of the spirit of the RP system, along with how it is intended to be applied in diverse and newly emerging circumstances. 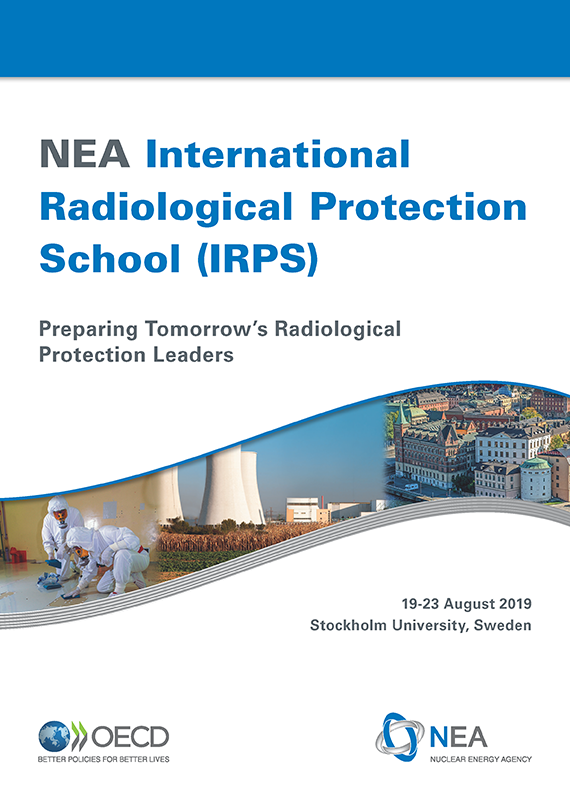 As a first step towards the establishment of a long-term programme, the NEA, in co-operation with the Swedish Radiation Safety Authority (SSM) and the Centre for Radiation Protection Research (CRPR) of Stockholm University, had decided to launch a pilot International Radiological Protection School (IRPS). state of the art: radiological aspects of biological, epidemiological and social science. illustrate good RP communication and leadership skills through presentations and case studies. This course was aimed at mid-career experts with relevant education and a minimum of five years of work experience in the field of radiological protection (see pre-requisites below). IRPS participants hold positions at government ministries, regulatory authorities, research institutions, nuclear fuel cycle industries or other industrial sectors where their jobs include providing policy and practical level advice on RP matters. Medical radiological protection experts were welcome to join the course; however, the application of ionising radiation in medical diagnostics or treatment was not the focus of the training. The teaching for each module was practical, dynamic and interactive. Talks and presentations from radiological protection experts were accompanied by case-based discussions and group exercises. Participants also had the opportunity to address relevant soft skills. Lecturers built participants' own experiences to keep discussions directly relevant to their situation and concerns insofar as possible. All course instruction, course materials and discussions were in English. relevant professional work experience in the radiological protection field. The table below provides a description of the suitable applicants' education and work experience. by 31 May 2019. Successful applicants will be notified by 17 June 2019. Participants were requested to complete a short pre-course assignment and to be familiar with a small set of reference documents. Details were sent to the selected participants, together with a list of reference readings. On completion of the programme, participants received a certificate of attendance. A total of 1.5 university credits (ECTS) could also be awarded to participants, by Stockholm University, upon request. The IRPS was organised by the NEA in co-operation with the Centre for Radiation Protection Research (CRPR) of Stockholm University and with the support of the Swedish Radiation Safety Authority (SSM). The International Radiological Protection School Advisory Board provided overall direction and strategy for the implementation of the IRPS. The Advisory Board is composed of well-respected radiological protection experts from around the world.